The regular 2019 NBA season may be over and that means the serious basketball business can really begin. The best 16 teams in the Eastern and Western conference make their way to the postseason and you can get an NBA Playoffs live stream of every game. NBA playoffs - when and where? The 2019 NBA Playoffs begin on Saturday, April 13 as the best 16 teams in the league face off in Round 1. The top eight teams in each conference will play a best-of-seven series to see which four teams will move onto the semi-finals. From there the two teams that win from each conference will meet at the Conference Finals and the two winners from those games will meet at the NBA finals beginning on May 30. The Milwaukee Bucks, Detroit Pistons, Toronto Raptors, Orlando Magic, Philadelphia 76ers, Brooklyn Nets, Boston Celtics and the Indiana Pacers will be competing for the Eastern Conference Championship while the Golden State Warriors, LA Clippers, Denver Nuggets, San Antonio Spurs, Portland Trail Blazers, Oklahoma City Thunder, Houston Rockets and Utah Jazz will be competing for the Western Conference Championship. There’s a lot of basketball to be watched and to catch it all, you’ll need to have access to ABC, ESPN, TNT and NBA TV. Not a premium cable subscriber? Don’t worry as we’ll walk you through all of the various streaming services available that have access to these channels. Whether you’re favorite team is competing in the Western or Eastern Conference, we’ll show you how to watch a live stream of every game in the 2019 NBA Playoffs online so you don’t miss a single basket this postseason. If you live in the US or UK and want to know how to catch a 2019 NBA Playoffs live stream, then keep scrolling and we’ll tell you your best viewing options. From there, you simply open the VPN app, hit 'choose location' and select the appropriate location - it's super easy to do. Choose any country showing a Playoffs live stream and watch as if you were in that country. If you live in the US and don’t want to pay for local cable television just to watch your local franchise, catching those NBA games live is made very difficult for you. Because the NBA agrees to exclusive rights for those stations, even streaming services won’t show live games as the action happens. You have to settle to watch the game when it’s replayed. But using a VPN is a handy way around this. Grab one of our recommend VPNs above, log in and connect to a server outside the blackout region and you're ready to watch some basketball. This was you can watch all games in the NBA Playoffs as they happen live from anywhere in the world. Unfortunately the NBA’s own streaming service (the League Pass) won’t be showing either the NBA Playoffs or the Finals live online as all of these games will be nationally televised. If you’re already a League Pass subscriber though, you will still be able to watch these games in the service’s archives, though they won’t be available until three hours after they air on TV. If you’re looking to watch the NBA Playoffs live on TV however, then you’ll need to narrow down which channels are showing which conference’s games and lucky for you, we can help you with that. If your favorite team is playing in the Western Conference Finals, then ESPN is your only choice to watch those games as the network has the exclusive rights to broadcast the Western Conference Finals on TV. On the other hand, if your franchise is playing in the Eastern Conference Finals, then TNT is your only option as the network has secured the rights to broadcast those games. The NBA’s own network, NBA TV will air some first round games on TV, so if you don’t want to miss a single minute of the NBA Playoffs, you’ll need a cable package or streaming service with access to NBA TV. Finally, for the 17th consecutive year, ABC has the sole rights to broadcast the NBA Finals. If you want to watch the finals, you’ll have to do so on ABC. We wish watching the NBA Playoffs was easier on TV but you can get around network exclusivity deals by opting for a streaming service that gives you access to every channel showing the playoffs. Hulu with Live TV $44.99 per month - Hulu with Live TV gives you access to ESPN, TNT and ABC in most markets but the service doesn't include NBA TV. The service supports a wide variety of streaming devices and even includes its own Hulu Originals in case you want a break from watching sports. Playstation Vue starting at $44.99 per month - Playstation Vue has four plans: Access, Core, Elite and Ultra but you'll need to opt for the Core plan at $49.99 per month to watch sports. The service's base plan gives you access to ESPN, TNT and ABC in most markets but you'll need to check to see if the plan you choose has NBA TV. There is also a 5-day free trial available. DirecTV Now $50 per month - DirecTV Now gives you access to ESPN, TNT and ABC in most markets but only some plans offer NBA TV. You can stream on up to three screens simultaneously and with the DirecTV Now app you can watch live TV on the go. There are also a number of add-ons available for premium channels such as HBO, Starz and Cinemax. New customers can take advantage of a 7-day trial but you'll have to purchase on of DirecTV Now's packages first. Sling TV starting at $15 per month - Sling TV's Sling Orange or Sling Blue packages each cost $15 or you can combine them for $25 per month. However, each package contains different channels so make sure the one you choose has the channels you want to watch. The company is currently running a promotion where new users can get 40% off. Sling TV gives you access to ESPN, TNT and ABC in limited markets with NBA TV available as an add-on. fuboTV $44.99 for the first month - fuboTV doesn't include ESPN but you do get access to TNT, NBA TV and ABC in most markets. The service also includes Cloud DVR so you can record games to watch them later and if you forget to record a game, the company's 3-day replay allows you to replay nearly any game, show or movie that aired in the last three days. FuboTV even offers a free 7-day trial so you can test out the service. YouTube TV $49.99 per month - YouTube TV gives you access to ESPN, TNT, NBA TV and ABC in most markets. The service also offers NBA League Pass. With YouTube TV you get free unlimited DVR storage space to record games for later and you can stream the service on three devices simultaneously. A free 14-day trial is also available so you can test it out for yourself. For years now, basketball fans in the UK have associated the NBA with BT Sport but that all changed when the network declined to renew its exclusive broadcast rights this year. Thankfully though, Sky Sports stepped in at the last minute and announced that it had signed a four-year broadcast deal to air NBA games in the UK. 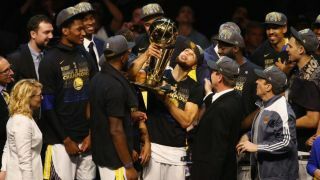 The network aired more than 170 live games during this year’s regular season and it will continue to show games throughout the NBA Playoffs and Finals. If you’re not already a Sky Sports subscriber and don’t feel like paying for the service just to watch the NBA Playoffs, don’t worry as you can buy a daily, weekly or even monthly Sky Sports Pass on Now TV. This will allow you to watch the NBA Playoffs, NBA Finals and even other sports shown on the network. And if you find yourself outside the UK at any stage during the playoffs then don't forget that you can always use a VPN to change your IP address back to the UK and watch as if you were back at home.